Heavy Duty Towing and Recovery is Jets Towing’s specialty. We provide state-of-the-art and top of the line heavy wreckers that are handled by expert truckers with years of experience hauling loads on the road. We rely on the perfect combination of capable machinery and experienced drivers to help our customers with all of their heavy duty towing needs. We guarantee that no matter what the scale of the towing job, we can easily handle it, and do so at a fair cost to our customers. We provide 24-hour heavy duty towing and truck repair in NYC. We have a fleet of trucks and heavy duty towing and recovery equipment. Our heavy duty trucks can tow all kinds of large vehicles such as dump trucks, school or transit buses, mobile cranes, construction equipment, tractor trailers and even fire trucks. 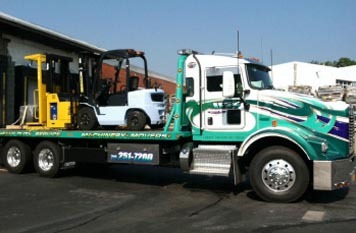 Whatever the heavy vehicle may be, if it needs to be towed or recovered, we can take care of it. We are well aware of the pandemonium that ensues when a heavy vehicle rolls over on the road. In such situations, you need a reliable provider of towing services that can reach the spot in record time and proceed to clear the way and haul the heavy vehicle to be repaired. This is precisely the service that we, at Jets Towing, proudly provide. We take our job very seriously and this resonates in the attention to detail, and competence of our drivers. We handle every job with extreme care and strive to deliver the most professional towing service in the area. Our tow trucks are equipped with wheel lift and under reach capability, which allows us to ensure that no damage is caused to the vehicles while they are being towed. When it comes to heavy duty towing in Brooklyn, Jets Towing is who you need to call. Our commitment to provide the most reliable and impeccable towing services in the region has propelled us to always pursue excellence and never compromise on customer satisfaction. If you need any type of heavy duty towing or recovery service, contact Jets Towing, the one stop shop for all of your towing needs.